Summary: Where the Water Tastes Like Wine is an adventure game that perfectly encapsulates the spirit of adventure. Roam the United States countryside, meet interesting folks and swap tall tales until sunrise. 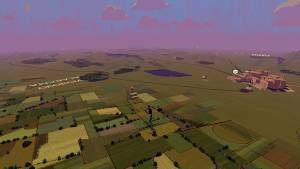 The term ‘Walking Simulator’ is often used as a pejorative to dismiss narrative-based adventure games that are often light on gameplay elements, despite being primarily designed to deliver an engaging narrative experience. 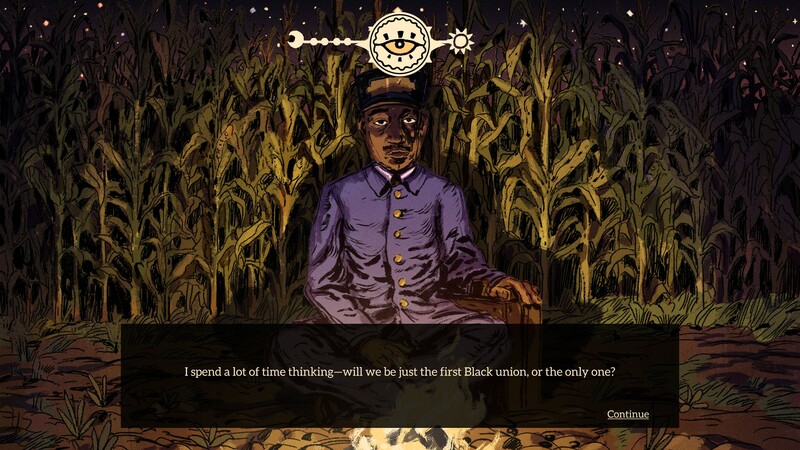 If you’re the type of person that thought Gone Home was boring or that the gameplay mechanics in What Remains of Edith Finch weren’t compelling enough, then Where the Water Tastes Like Wine definitely isn’t for you. If you did enjoy those games however, then you’re in for a treat, because Where the Water Tastes Like Wine is up there with some of the best ‘walking simulators’ around. Where the Water Tastes Like Wine is a narrative adventure game in the most literal sense. 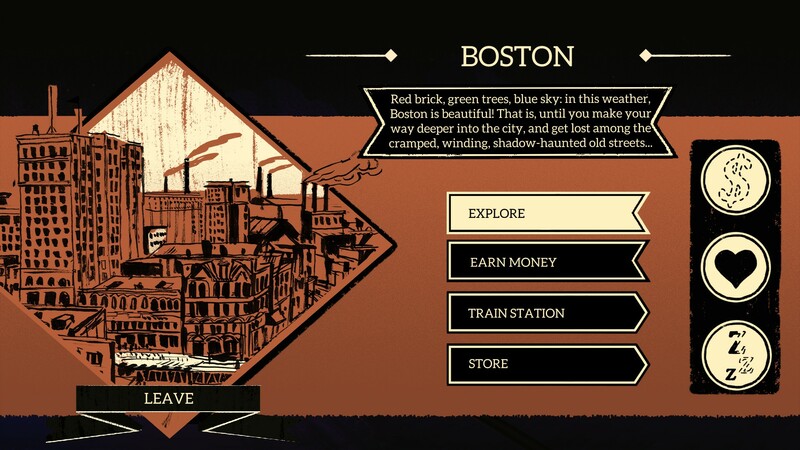 You play as a vagrant skeleton, travelling across prohibition-era United States, collecting stories in order to settle a debt to a mystical man-wolf. 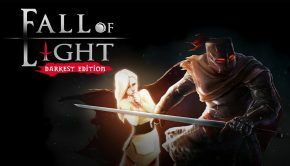 That last sentence may give you the impression that this game is fantastical and outlandish, and in some ways it is – but one of its greatest strengths is the way it represents this fantasy as folk lore. The gameplay is split into two parts. Half of your time is spent physically travelling across a gigantic map view representation of the United States, wandering from one point of interest to the other. 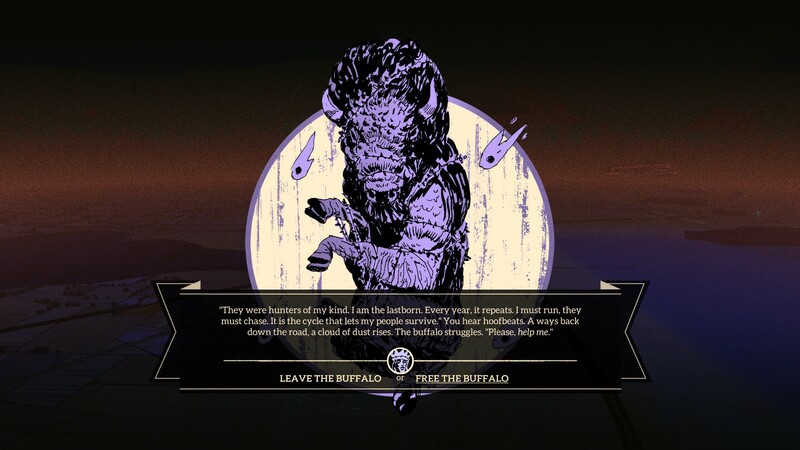 Upon arriving at these points of interest, the game transitions to something of a visual novel as you are presented with a short, self-contained narrative in the form of a still image accompanied by a few lines of dialogue. This might be a dramatic scene that you witness, or a conversation with an interesting person. 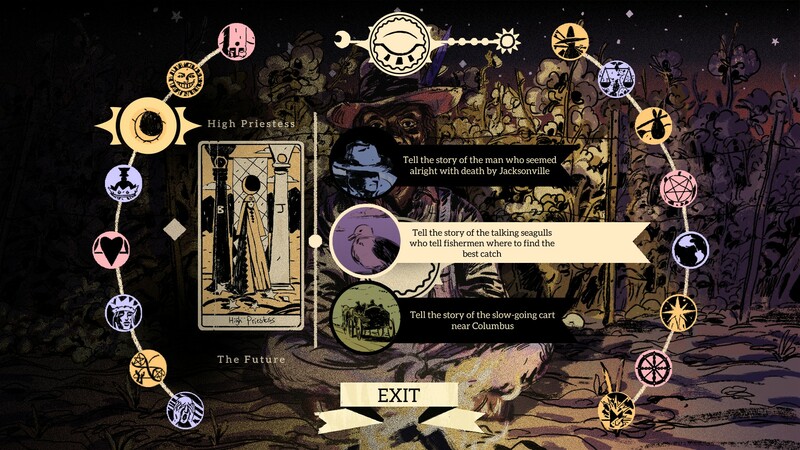 These narratives are recorded on tarot cards to be collected and swapped with other characters throughout your adventure, ultimately leading to the settlement of your debt with the mystical man-wolf. The vast majority of these scenes are expertly narrated and fantastically written. The narrator’s line delivery is superbly dramatic in just the right ways to completely draw you into the story being told (though some of the character voices that the narrator puts on can be a little odd at times). 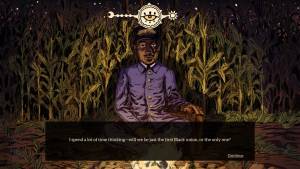 Listening to these small narrated scenes can be as engrossing as a good audio book. As you travel across America, you’ll meet pivotal characters wanting to hear the stories you’ve collected. 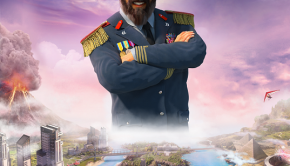 Each of these 16 characters are written by notable game industry personalities (such as Kotaku’s Gita Jackson or Waypoint’s Austin Walker) and are voiced by notable talents including Kimblerley Brooks (Voice of Ashley Williams in Mass Effect) and Sting (mostly known for his recent Jamaica-centric collaboration album with Shaggy). 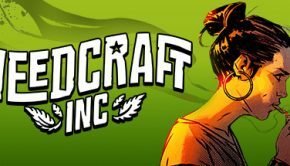 These characters all have fascinating backstory’s and insights, which they share with you as your bond builds with them. Building bonds with these characters requires finding their campsite out in the open world and spending the night swapping stories by the campfire. The character will request a particular type of story (scary, thrilling, funny and sad, to name a few) and it’s up to you to choose a story from your deck of cards that suits that theme. The more you fulfill their requests, the more they’ll open up and tell you about themselves – though you’ll need to track them down and talk to them again multiple times to maximise your bond. Thankfully their location is always shown on your map. Not only are the two primary gameplay parts completely separate mechanically, they’re also completely averse visually. Exchanging stories with characters, witnessing dramatic scenes and exploring cities are all represented as beautifully drawn still images in a rough sketchpad style, something that a wandering storyteller might make use of. 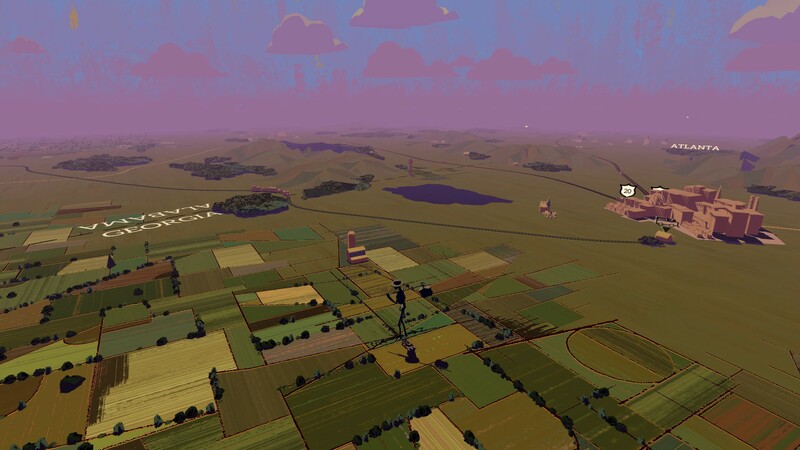 On the other hand, the open world looks like a huge, 3D, stylised map of America. There are low-poly roads, train tracks, fields, lakes, trees and mountains in places where they should be to make the world feel authentic. Your character is represented as a large polygonal skeleton and it takes less than a minute to walk from San Francisco to Los Angeles. The low fidelity look of the open world has a cool, stylish aesthetic and works well to represent wandering across the United States. Also worth mentioning is the game’s fantastic soundtrack. 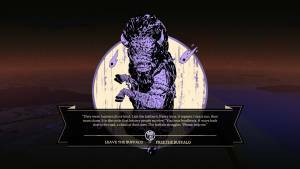 When you first enter the open world and are told to go explore at your behest, a bluesy folk-song starts to play in the background that perfectly captures the time period, the spirit of adventure and is just good ol’ walking music. There are numerous tracks that fit this description, and they’re so darn good that I occasionally just let the game idle while I do other things, just to hear the music in the background. 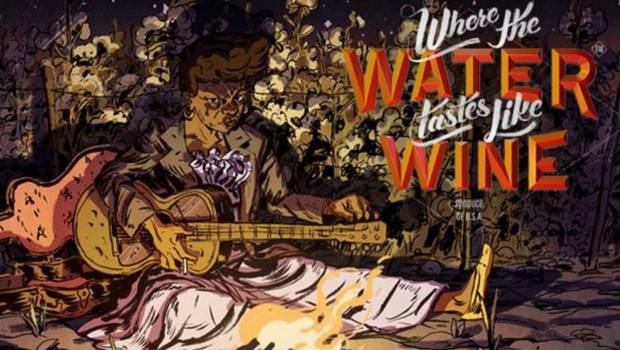 The core reason I like Where the Where the Water Tastes Like Wine is that it absolutely captures that feeling of travelling and adventure. When you talk to people in real life that have taken prolonged periods of time to travel around, they come back with a deck full of tarot cards worth of stories that you could easily lose the night listening to. 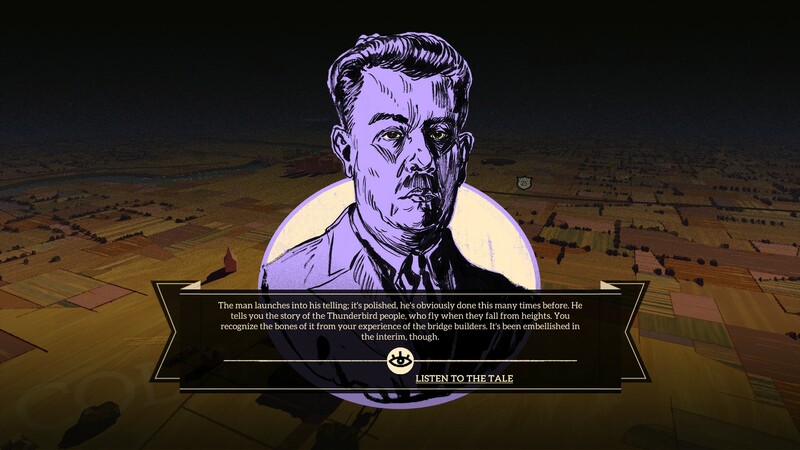 Where the Water Tastes Like Wine puts you in the shoes of that fabled wanderer and allows you to experience these stories first hand. You get to decide where you want to go, what you want to see and who you want to talk to. Understandably, this won’t appeal to everyone. 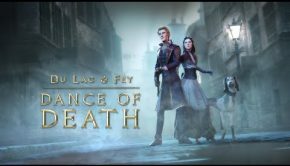 There’s very little to the gameplay mechanics and a lot of your time will be spent meandering around without much to interact with (turns out the USA is a big place!). 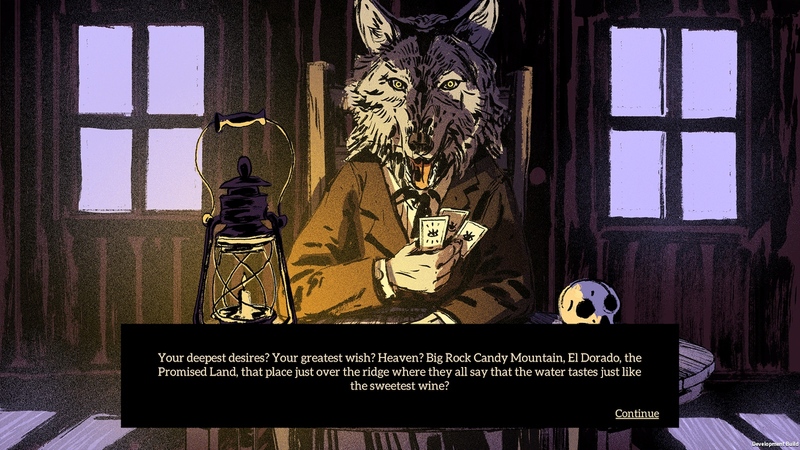 But if you’re interested in a slow-paced, 20+ hour adventure, filled with well-written, engaging stories accompanied by some great artwork, then Where the Water Tastes Like Wine should not be missed.